New Delhi: Praveer Sinha, CEO and MD, Tata Power Delhi Distribution (Tata Power-DDL), shared the success mantra with the passing out post graduate students of the MBA Executive and MBA Healthcare Administration 2015-17 batch at the Faculty of Management Studies’ (FMS Delhi) convocation in New Delhi. Mr Sinha who was the chief guest at the ceremony felicitated 100 students during the ceremony. Congratulating the graduating students, Mr Sinha asked them to work hard and achieve excellence in their respective fields and earn laurels for their parents, alma mater and the country. He also asked them to bring new innovations at their work places and make a change in the lives of various people they come across in their life time. 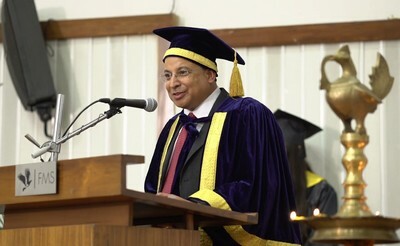 While addressing the graduates and faculty members, Mr Sinha focused on the significance of happiness quotient in professional life and how it can make one succeed braving all odds. “Happiness is essentially a dynamic factor in our professional lives. It drives us to achieve success and stay the course. We all must inculcate a habit to remain happy and focussed for a longer and impactful professional innings. It is the mantra of success in the corporate world. I urge you all to enter the next phase of your lives with confidence and an unwavering commitment to work hard towards building a new India,” said Mr Sinha. “I also take this opportunity to compliment Professor Sunita Singh Sengupta, head and dean, Faculty of Management Studies, and all her distinguished colleagues for their sincere endeavours to take the FMS forward on varied fronts. I wish this institution great success in the coming time,” Mr Sinha added.